While The Peninsula Country Golf Club opened in 1925, planning first began in 1922 when an organisation called Tower Golf House Co. Ltd. issued a prospectus outlining plans to establish a residential golf house. The purpose was to acquire 450 acres at Frankston to create an 18-hole course plus a 9-hole course for women! The house on the property was called the Tower House, a painting of which hangs in the lounge. It was difficult to raise the capital to buy the land but eventually in December 1923 the Tower Golf House opened for business. In a comparatively short time, an 11-hole links was made available, along with a putting green, tennis courts and croquet lawn, garages and a professional’s house. A small group took the initial steps to acquire the property for the purpose of establishing a private country golf club. Eventually the club was to be known as The Peninsula Country Golf Club. The foundation members took over the existing clubhouse on New Year’s Day 1925. The final 7 holes were completed 18 months later, and the first day of play on the full course took place on 25th September 1926. A plantation fund was established in 1929. This led to the cultivation of native shrubs and trees around the course, which brought the wonderful bird life which abounds today. In 1946 construction on the 9-hole course was suspended during the war, but was eventually resumed and completed in 1948. In the early 1960’s a decision was made to build a new clubhouse at the present location, and to create two 18-hole courses. This new clubhouse was officially opened on 22 July 1967. The Club’s Founders and pioneering members are remembered, in perpetuity, by the various golf trophies named in their honour. Kingswood Golf Club had its origins back in 1904 as the Dandenong Golf Club. At a special meeting held in 1921 a Committee was formed to investigate the purchase of a property known as “KINGSWOOD”. Below: Extract from the Sub-Committee Meeting of the Dandenong Golf Club on 20th October 1922. This Sub-Committee was formed to discuss the advisability of purchasing land for a links. The Club ultimately acquired this property and constructed a links. It was not until 1937, after a number of moves around various paddocks in the Dandenong area, that the Club found its permanent home in Dingley Village. By then it had been renamed Kingswood Golf Club, named after the leased property it had occupied for 16 years before its final move. The new “home” was 120 acres of undulating market garden land in what is now the world-renowned Sandbelt region. Leading golf course architects of the day M.A. & V. Morcom designed a golf course that was then the second longest course in Australia at 6,707 yards. A number of changes have taken place over the ensuing years with architectural “contributions” made by Thompson and Wolveridge, Grant and Spencer, Kevin Hartley, E & G Parslow, and most recently, four magnificent new holes designed by Tony Cashmore. 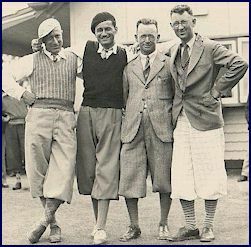 Golfers circa 1937, Cedric Broomhall is on the far right. Kingswood is not as well known as some of its more famous sandbelt neighbours, but it loses little in comparison as a championship standard golf course. Wonderful couch fairways, fast true greens, superb bunkering and lakes coming into play on six holes provide not only a great golfing challenge, but also a delightful playing environment featuring an abundance of birdlife. The fact that the Club has hosted many State and National Amateur Championships over the years bears testament to its quality and regard in which it is held. In the early 1990’s Kingswood undertook some major projects. The Clubhouse was completely refurbished and extended. A deliberate approach to retain the charm and character of the old building was taken. Today, this charm and character is frequently commented upon by the many visitors who enjoy the atmosphere, ambience and comfort of the clubhouse, with its honour boards featuring prominently all around. At the same time a massive lake was constructed along and around the back of the 8th hole (then 6th hole). This lake provides the Club with major benefits as it is now one of the main water storage facilities, and it provides an aesthetically pleasing “buffer” between the course and neighbouring houses. Kingswood Golf Club has been blessed with many great Presidents and Captains over the years. Their leadership is evident by the quality and standing of our Club today. The late Vern Ellis served the Club as President for four years and also as Captain for four years. David Martin and Doug Blair were not only fine leaders of Kingswood Golf Club, they also made their mark as Presidents of the Victorian Golf Association (1959 and 1965, and 1987 and 1992 respectively). 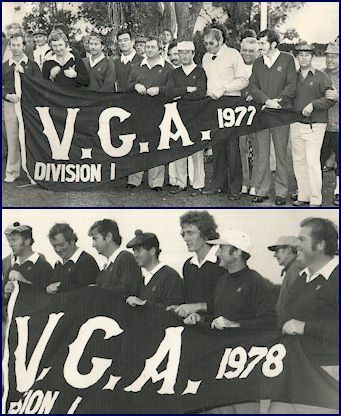 Since Kingswood joined the Victorian Golf Association back in the early 1930’s it has produced many champion golfers. Life Member and past Club Captain John Hood won many top amateur titles, including the 1963 German Amateur Championship and eight Club Championships. In his 64 years of membership John has had an illustrious golfing career. Peter Sweeney won the Australian Amateur Championship in 1976 and has been Club Champion eight times. Peter, still an outstanding golfer after many years playing elite level amateur golf, played a significant part in Kingswood’s great 2001 Pennant win. Ken Kilburn, Club Champion on eight occasions retains his low handicap and consistent form, regularly winning or doing well in State and National Seniors Championships. The late Bill Higgins was revered at Kingswood. He won 15 Club Championships between 1938 and 1966. Back to back Division 1 Pennant wins in 1977 and 1978. Copies of the “Tin Shedders” book are available for purchase, which gives a comprehensive insight into Kingswood’s history, written by Mark Harding. Cost: $25 inc Postage & Handling. If you would like to order your copy, please email: general@kingswoodgc.com.au.